The Final Four is tomorrow!! Are you ready? Not gonna lie – I’m mainly a football junkie but I love the intensity of any high stakes game. And of course the food that surrounds the event. Tailgating at LSU is, after all, what got me hooked on football in the first place. For any big game, I want food that I can make ahead so that I can keep my eyes focused on what matters. 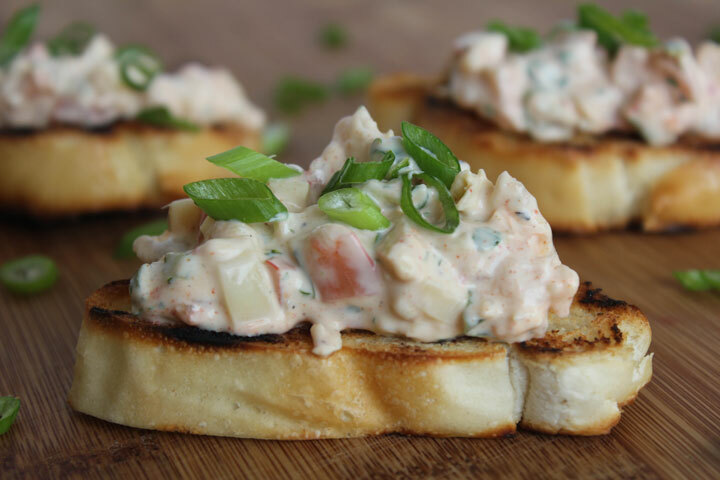 This smoky shrimp, hearts of palm & roasted red pepper dip made with Knorr Vegetable Recipe Mix takes no time to whip up, can be made a day in advance and is a definitive crowd pleaser. I hope you guys enjoy it as much as we did! Buen Provecho! Combine all ingredients for the dip into a large bowl. Mix thoroughly. Chill for at least 1 hour or up to 1 day before serving. Garnish with thinly sliced green onions. Serve chilled with toast points, tortilla chips or veggie sticks for dipping. I made this recipe this past weekend for a party. I had to leave out the shrimp, because of a shell fish food allergy, but it so good! My picky eater husband gave his approval and that is huge! Thanks so much for the new twist on the basic Knorr recipe on the back of the package. I will make this again. That’s some delicious recipe! What if I don’t have a sour cream, what alternative can I use? Thanks in advance! This dip looks so delicious! We can’t wait to try this at our holiday party!